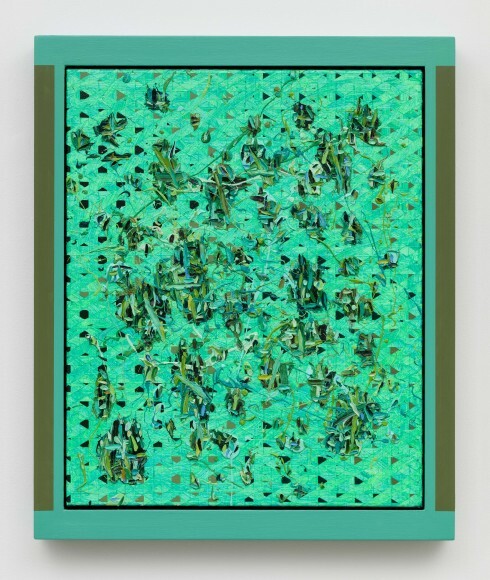 Douglas Melini, Untitled, 2014, Oil and acrylic on canvas with hand painted frame, 25.5 x 21.5 x 1.75 inches. This fall, the Schneider Museum of Art (SMA) will present Breaking Pattern, an exhibition curated by Matthew Deleget and Rosanna Martinez of the Brooklyn-based gallery Minus Space. The exhibition will highlight several generations of artists from coast to coast whose works investigate and advance the discourse around pattern, optical, and perceptual abstract painting. The community is invited to the opening reception of Breaking Pattern on Thursday, October 1 from 5:00 to 7:00 PM. The Museum will show the works of seven artists: Michelle Grabner, who co-curated the 2014 Whitney Biennial and will curate the next Portland Biennial exhibition; Gabriele Evertz, whose artwork is included in the public collections of the Museum of Modern Art and The Metropolitan Museum of Art among others; Anoka Faruqee, an associate professor at the Yale School of Art; Gilbert Hsiao, who has received awards from the New York Foundation for the Arts and the Marie Walsh Sharpe Art Foundation; Douglas Melini, who received a painting fellowship from the New York Foundation for the Arts; Brian Porray, whose most recent exhibitions include Abstracted Visions: Information Mapping from Mystic Diagrams to Data Visualizations at Cerritos College Art Gallery in Norwalk CA and Plant People at GAR Gallery in Galveston TX; and Michael Scott, who has worked internationally for the last three decades exhibiting at Le Consortium (Dijon, France) and Musée des Beaux Arts (La Chaux de Fonds, Switzerland) among others. Please join us on Thursday, October 1 from 5:00 to 7:00 PM for the opening reception of Breaking Pattern. Crater Lake Cellars is generously donating and pouring wine for this reception. During the reception, performances at the Museum’s courtyard will include the Maraval Rd. steel drum band, and a theater mask and movement medley by Oregon Center for the Arts students. The exhibition will be on view from Friday, October 24 to Saturday, December 5, 2015. Regular Museum hours are Monday through Saturday, 10:00 AM to 4:00 PM. Matthew Deleget will give a free public lecture on Wednesday, September 30 at 6:30 PM in the Meese Auditorium. He will speak on his different roles as an artist, a curator, and a gallerist. Three FREE Family Days will accompany the fall exhibition on Saturday, October 4, Saturday, November 7, and Saturday, December 5, from 10:00 AM to 1:00 PM. The Museum will also hold Tuesday Tours – weekly docent-led educational tours for the public on Tuesdays at noon. Please call to schedule a special tour for your group. The Schneider Museum of Art’s fall exhibition is generously supported by Crater Lake Cellars, Art Works-the National Endowment for the Arts, the Oregon Arts Commission, The Ford Family Foundation, Market of Choice, Rogue Frameworks, and Wooldridge Creek Winery.